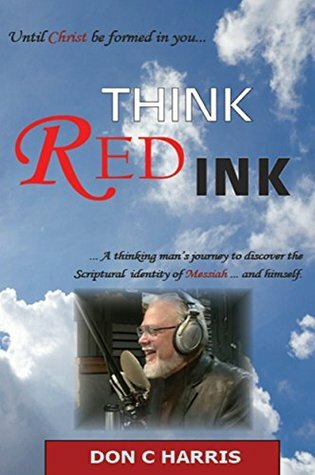 SR Johnson’s review of Think Red Ink: Until Christ be formed in you...[Think Red Ink] ...A thinking man's journey to discover the Scriptural identity of Messiah... and himself. SR Johnson's Reviews > Think Red Ink: Until Christ be formed in you...[Think Red Ink] ...A thinking man's journey to discover the Scriptural identity of Messiah... and himself. Think Red Ink: Until Christ be formed in you...[Think Red Ink] ...A thinking man's journey to discover the Scriptural identity of Messiah... and himself. •	Background information about the book - Think Red Ink is a reference to the words of Jesus which are printed in red in many Bibles. •	Author's purpose - The author's purpose is to provoke Christians to love truth over tradition; to give people permission to doubt and to investigate their faith in the light of the Scriptures, not denominational creeds; to persuade people to leave fantasy and honestly consider what Jesus said. •	Author's thesis - The authority of the words of Jesus (the substance of the admonition to "think red ink") provide the Scriptural foundation for Christianity. •	Summary - Think Red Ink relays the life of Don C Harris as he struggles from childhood to believe the Bible and the inconsistent doctrines of the churches he attended; later even as he excelled in the business of church - he became disappointed with God and walked away. However, instead of becoming atheist, Don decided to give the Bible another read with the commitment to believe what he found, rather than to search for what he believed. Don traveled the United States living in a converted city-bus motor home for 20+ years. This "exile journey" separated Don from alliances and obligations to orthodoxy. Using the literary device of personal stories interwoven with an introduction to the Traveler (Don's revelation of history), the reader is invited to walk along with the Apostle Paul and Don, as the story of the Scriptures comes to life. •	"Think Red Ink" in its declarative form is a cry for men and women to take another listen to the instructions of Jesus, the Son of the God. •	In 2003, Harris wrote his first book, The Questions of Jesus. Don's second book, The Red Letter Questions, was published by Bridge Logos in 2007. •	Strengths and weaknesses: There are times the theological doctrines piqué a curiosity for more details than this work delivers. Some supporting information is available in the Appendix. The stories of Don's life are not given in a chronological order, rather, Don utilizes life anecdotes to facilitate the reader in a gestalt process or discovery of theological truths he found. Harris allows, nay, rather demands the reader participate in the revelation and discovery of their own path. He is not a writer who mandates certain processes or ascription of certain beliefs that are applicable to every man...with one exception; he steadfastly draws the reader, the Christian to the authority of Jesus Christ. •	The effectiveness of the author's argument: Christian denominational promises offered to Don did not give him the strength or ability to be changed. Exchanging a "bad habit" (smoking) for an "accepted habit" (gossip or overeating) is not the thing that led to the regeneration and strength of the Apostle Paul - Paul learned from the Great Teacher, Jesus. Don maintains this same Teacher is available to all. For a Christian, there can be no greater authority than the words of Christ. Don makes a solid argument for a Christianity which is measured by changed lives. •	The soundness of the author's conclusions: There is a questioning and an honesty which haunts the reader who is comfortable with accepted traditions and methods of worship. The retooled doctrines, "We've decided..." religious practices of today are removed from the simple instructions of Jesus. Think Red Ink is not aligned to a particular set of doctrinal rules. The foundation of the book is the author's experience with solid Scriptural support. •	The practicality of the author's recommendations: The idea of obeying Jesus, looking to His words for doctrine is simple, however, the distance between the brilliant advice of a Galilean preacher and the modern Christian practice is expansive in some cases. The basic requirement is simply honesty. A man's journey to seek truth, not fantasy, to doubt that which could not be supported in church rhetoric. The reader may only see one man's journey through the trials of life; others will be encouraged by the ensample of a modern witness of the faith of Jesus Christ. Those who love truth will rejoice! •	Don is an iconoclastic man of rare courage. History will compare the revelation of "think red ink" to the progress of Martin Luther. Sign into Goodreads to see if any of your friends have read Think Red Ink.